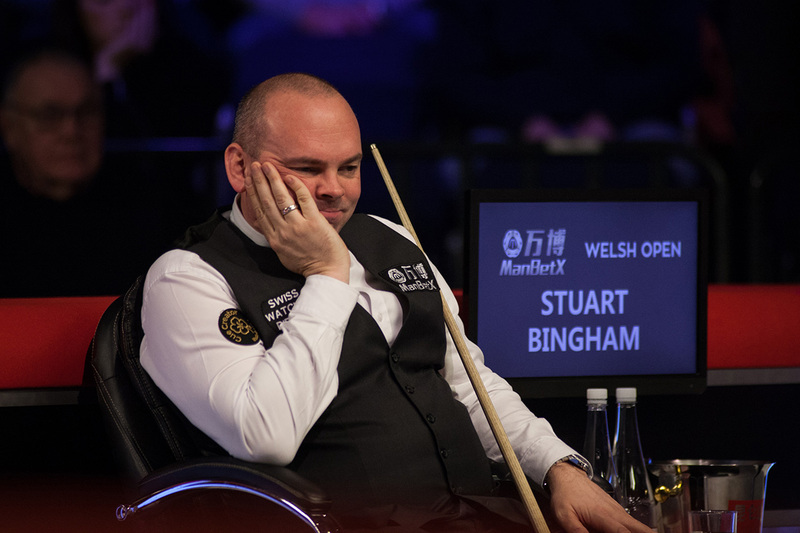 Matthew Stevens ended Stuart Bingham’s ManBetX Welsh Open title defence with a 4-1 win at the last 32 stage in Cardiff. Bingham beat Judd Trump in a thrilling final last year but his grip on the Ray Reardon Trophy has now slipped as Carmarthen’s Stevens goes through to face China’s Yan Bingtao. Former Masters and UK Champion Stevens knocked in breaks of 76 and 79 as he reached the last 16 of a ranking event for the second time this season, having done so at the China Championship. Northern Ireland Open runner-up Yan saw off Peter Ebdon 4-1 with a top break of 77. Ronnie O’Sullivan took just 44 minutes to beat David Grace 4-0 as he stayed on course for a possible fifth ranking title of the season. He fired breaks of 96, 133, 63 and 100 in a magnificent display. John Higgins eased to a 4-0 win over Sam Craigie with a top break of 71. Mark Williams, the last Welsh player to win this title back in 1999, suffered a 4-2 reverse against Martin Gould. Londoner Gould made breaks of 110, 62 and 58 to set up a match with Barry Hawkins. That results boosts Gould’s hopes of jumping into the top 16 seeds for the Players Championship; he is currently in 17th place but only £500 behind Yan and £4,000 behind Graeme Dott. Kyren Wilson came through a tough battle against James Wattana which came down to the last few balls. In the deciding frame, Wilson trapped his opponent in a snooker on the green and from the chance that followed cleared to win 4-3.